This is a well known rural scene of the day representing the annual celebration of May Day. 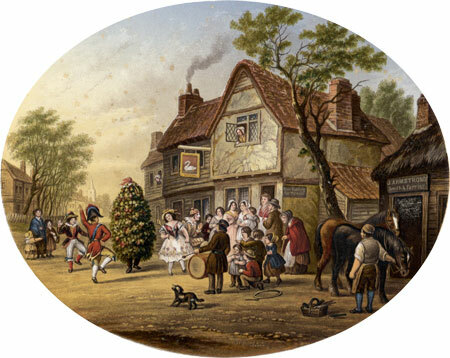 The group of dancers consist of a soldier, a gallant, a singing harlequin and a 'Jack in the Green' dance to a fiddler's tune. Published by Le Blond & Co. using the Baxter Process. Abraham Le Blond was one of George Baxter's few licensees. Le Blond published a total of 32 Ovals of a similar size between 1853 and 1870. They were all printed directly onto plain paper which was then embossed to form a border around the print with a title and number below..
Each print usually has at least one signature towards the bottom edge. Some ovals can be found unsigned, but most are signed "Le Blond & Co., London" and many also carry the signature "L. A. Elliot & Co., Boston, U.S."
L. A. Elliot & Co. was a print selling business set up by Lucius Elliot and trading under this name from 1875 to 1884. They imported and distributed Le Blond's prints in the USA. The inspiration for most, if not all, the Ovals were paintings by the artist John Anthony Puller (see our July 2012 feature about Puller.) The prints are practically identical to the paintings both in content and size. Size 5 x 6 1/2 inches approx. Le Blond number 85.